In this episode we will talk about Aztlán, the place, according to legend and oral history, where the Aztec people originated. There are several questions regarding this place of origin. Was Aztlan real or imaginary? And, if Aztlan was an actual place, where was it located? Almost 5 centuries after the Spanish conquest of the Aztec Empire we might be closer to answering these questions. We will start off by talking a little bit about the Aztecs. The meaning of the word, “Aztec,” first of all, means, “the people of Aztlán.” At the time of the Spanish arrival in the beginning of the 16th Century, the Aztecs had ruled most of central Mexico from their capital of Tenochtitlan, situated on a series of interconnected islands in the middle of Lake Texcoco in what is now the Valley of Mexico, the site of modern-day Mexico City. The empire was comprised of subjugated client states that paid tribute to the rulers at Tonichtitlan, and some of these states were located over a thousand miles from the capital. The empire comprised many different peoples and language groups. For the purposes of this podcast when we talk of “the Aztecs” we will be referring to the ethnic group often called the Mexica or the Mexica-Tonochcah, the people who came to rule central Mexico, imposing their laws, language and other aspects of culture on the subjugated. It turns out that the Mexica people were not indigenous to central Mexico but, like the Spanish to follow them, were outsiders and conquerors. Where the Aztecs came from can be traced through historical accounts and by using linguistics. The latter science, linguistics, provides us clues as to which tribes the Aztecs are related to and can help place their origins geographically. The Aztec language, Nahuatl, is from the Uto-Aztecan language family. In English we have words from Nahuatl: tomato, avocado, coyote, peyote, chocolate and chile to name a few. The Uto-Aztecan language family includes the languages of the Hopi, Shoshone, Northern Paiute, the Pima and the Utes of Utah, in addition to several indigenous groups of northern Mexico. The linguistic connection to people living as far north as Idaho and Montana gives some support to the assertion that the Aztecs came from someplace north of the present-day US-Mexico border. This language kinship together with a legend of southern migration make for a pretty solid case that the Aztecs were once northerners. The Aztec origin stories were chronicled by the early Spanish conquerors who were curious to know where these people came from. A notable chronicler was a Dominican friar named Diego Duran who came to central Mexico – then called New Spain – at the age of 5 around 1540. He learned the Aztec language and began writing down stories about the Aztec gods, descriptions of the Aztec calendar and the legends associated with the origins of the people. We also have a document describing the legend of Aztlán written by the Aztecs themselves in Nahuatl using the Latin alphabet. This document called Los Anales de Tlatelolco – The Annals of Tlatelolco – is a codex manuscript written on bark paper and contains no pictures, just text. The authors are unknown but it is believed to have been created in the 1540s, just 20 years after the Conquest and is further believed to have been a copy of an earlier manuscript possibly written in about 1528. This document was in indigenous hands for many years. Now, the codex is held at the National Library of France in Paris. 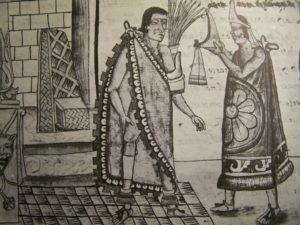 So, what does this Nahuatl codex and the accounts of the Dominican friar tell us about Aztlán and the origins of the Aztecs? According to the story, the Aztecs were part of the seven tribes of Chicomoztoc, which translates to “The Place of the Seven Caves.” Along with the Aztecs were the Acolhua, Chalca, Tepaneca, Tlahuica, Tlaxcalan, and Xochimilca. Some historical accounts have the Aztecs emerging from a hollow earth and into the caves and then to the surface of the earth. When the 7 tribes came out of the caves they wandered the land for years as one group. According to ethnohistorians, this happened somewhere between 1100 and 1300 AD. Eventually, the Aztecs settled in a magical paradise called Aztlan, which has been described as a large island in the middle of a large lake called Metztliapan, which translates to “Lake of the Moon.” There is some debate about the meaning of the word “Aztlán”. It has been translated as “The place of the white birds,” “The place of the herons,” “The white place” and “the place of the tools.” In some accounts the Aztecs fled because of a tyrannical elite and in other accounts there was a great natural disaster that caused people to leave the earthly paradise and head south to the area of modern-day Mexico City. In many accounts, once the Aztecs left Aztlán, they were pushed along by the Chichimecas, a warlike marauding group that did not want the Aztecs in their territories. In most accounts the Aztecs were guided out of Aztlán and to their new land by their god Huitzilipochtli who also told them from then on they were to be known as Aztecs, “the people of Aztlan,”so they would never forget their point of origin. A few illustrations of Aztlán exist as found in several Aztec codices. There is also an interesting and detailed 1704 depiction of the Aztec migration out of Aztlán by an Italian mapmaker Giovanni Francesco Gemelli Careri. In the 1450s, Aztec Emperor Montezuma the First gathered together the wisest scholars in his realm and some of the fiercest warriors to undertake a journey to discover the exact location of Aztlán. This could have been a purely political move, to unite quarreling factions in the empire, or it could have been a sort of “bread and circuses” distraction. Whatever the reason, the expedition returned to the capital of Tenochtitlan with news that they had found Aztlán. While the story of Montezuma’s expedition survives, an exact location does not. All we know is that it is somewhere north of modern-day Mexico City and that it is an island in the middle of a lake. Can we use modern science and scholarship to determine an exact location of Aztlán? There have been many theories, but to date nothing has been confirmed. When things are not verifiable it is often fun to look into the speculation and the educated guesses offered up by various researchers and amateur scholars. One popular theory is that the word “Aztlán” does not come from the language of Nahuatl at all and that it is derived from the word “Atlantis.” It’s almost amusing to look at some of the parallels. A big island in the middle of a big lake could mean a large landmass in the middle of the Atlantic Ocean. The one version of the story that the Aztecs had to flee Aztlán to avoid a cataclysm that destroyed their homeland closely parallels Homer’s account of the sinking of Atlantis. While this romantic version of the story sounds appealing, we have the linguistic evidence to show that the language of the Aztecs was not based on a Hellenic language or any other language of the Classical Old World, but was firmly rooted in a language tree that was fixed in North America. No customs are found similar on either side of the Atlantic either. Some people may cite the pyramid, but the pyramids in Egypt are markedly different from those found in Mexico. As long as the exact location of Aztlán cannot be fixed, the Atlantis connection will be seen by some as viable. If Aztlán really did exist, it is most likely that it was located somewhere in the northern or central parts of Mexico. In the states of Jalisco and Michoacan there are large lakes with islands in them and could fit the geography found in the tales. In 1887 Mexican anthropologist Alfredo Chavero asserted that Aztlán was on the Pacific coast of the Mexican state of Nayarit. Many contemporary anthropologists cite that the rounded mountain called Cerro de Culiacan is most likely a mountain featured in one of the chronicles as it fits the description of the mountain overlooking Aztlán and is located 150 leagues from Tenochtitlan as described in one of the early accounts. One cannot discuss Aztlán without referencing the 1960s Chicano movement in the United States. Some scholars have claimed that the original homeland of the Aztecs was located on the US side of the border. The area including the salt lakes of Utah has been a solid candidate for this mythical land and is probably the most widely referenced place on this side of the border as a possible location. The whole idea of the Aztec people originating in the American Southwest has been integrated into the socio-political ideology of many Chicano and Mexican-American groups. Many organizations such as La Raza Unida, the Brown Berets, the Nation of Aztlán and even the university student-based group MEChA have the belief in a Southwestern US Aztlán as part of their foundations for activism. Many in those groups believe that because the Southwest was part of the original Aztec homeland that mestizo, indigenous and Mexican-American groups have legal and primordial rights to these now-American territories and should be able to set up their own separate nation in the Southwest. Much has been written on this topic and the modern Chicano connection to Aztlán goes way beyond the scope of this podcast. Many believe that Aztlán is just a mythical and romantic place like Camelot, Shangri La or even the Garden of Eden, a place of purity that we would all like to return to someday, a paradise lost, a place of no cares and none of the complexities and tragedies of our modern world. While some investigators continue to press on and search for the exact geographical location of Aztlán, perhaps a place to start on our quest to find it begins in our hearts and souls. If any attempt is made to take any part of the United States of America by seperatists it will be met with the full military might of the U.S.A. If the Mexican government recognizes or supports any future seperatist action we will turn Mexico City into a radioactive slag heap. Our words are backed with thermonuclear weapons! If the press existed back then the people would have been against the genocide of our brothers the real native American. But what really separates us and them is that we believe that we belong to the world not the other way around. No borders #john ono lennon. JOE YOU SOUND LIKE AN ENEMY OF TBE PEOPLE OF AZtlan the Aztecs. from my Place of birth Michoacan where I am from. …Atlantis immigrants maybe maybe not but Many people wool visit our pyramids in Mexico and cities in Michoacan before your trump and walls. ignorant. envious entities from hell like you Joe…this earth must eventually use thermo nuclear weapons on hellish demonic brains such as you. Biggots racist joe has no country no legend no story a thief. go back under the rock you came out from.pendejo. who the hell raised you who spun you. go back. now understand this I just have used weapons of thermo nuclear on your stupid retarded cacaroach brain and all who rejoiced in your desire to abligerste Mexican people deprived of their land territory and history treasures. go pond sand. Lol. This is the real alien movement. E.Ts . Ufo. Not from Mexico. Dumby. Lol. It’s the Walmart eating people with reptilians. Wake up. Guns will not help you when your enemy can become invisible. ASENTAMIENTOS PERDIDOS DE LOS AZTECAS is the title of the book that explains all in detail (in Spanish,soon in English) it was a volcanic eruption that forced the Aztecs to leave Aztlan,the route and cronology of the migration since 1064 to 1107 D C when the 7 Aztec Tribes arrived to Chicomoztoc “The Place of the seven Caves” (I was borned in Chicomoztoc!! 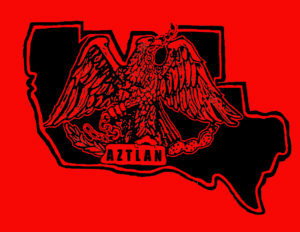 in the state of Jalisco in México) Aztlan is not a city it is a territory to the north of México! !